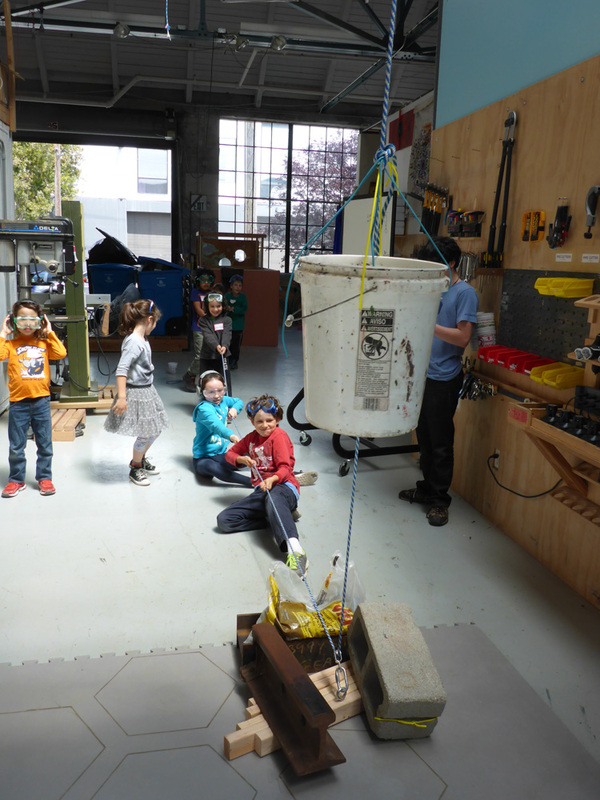 In the Tinkering School warehouse, there is a giant pterodactyl skeleton that lives in the rafters. One of the teachers at the day school made it for a party, and now it has found its home with us. This huge sculpture is often a topic of conversation and also sometimes an overstimulating distraction when we're trying to do tool training or talk about safety! At this last one day workshop of the season, we decided that the pterodactyl needed a friend in the rafters. An alligator. We would design it. We would build it. We would lift it to its friend in the ceiling! But first, tool training and practice! 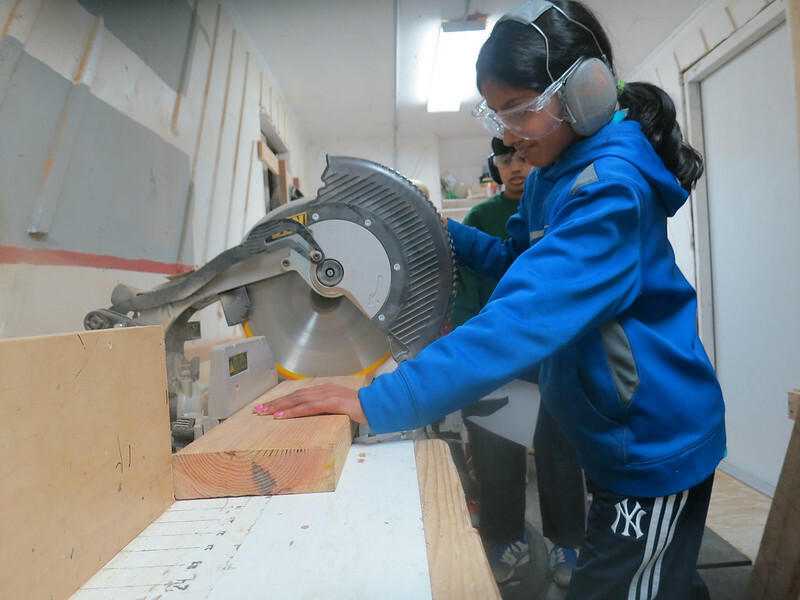 As a group, we learned how to use the chopsaw, drills, and clamps and got a chance to practice working together to cut and clamp and drill things. After training and practice and some lunch (!) we got to work on our designs for the alligator elevator. We split into two groups, and worked the rest of the afternoon on our plans. One group designed and built the alligator, and the other group figured out how to lift heavy things using pulleys and mechanical advantage. What was great and rare about this one day workshop was the under of iteration opportunities we created. A thing that we often struggle with, as educators, in these short one-day situations is that we run out of time. We simply don't have the time to produce multiple versions of the same experiment. 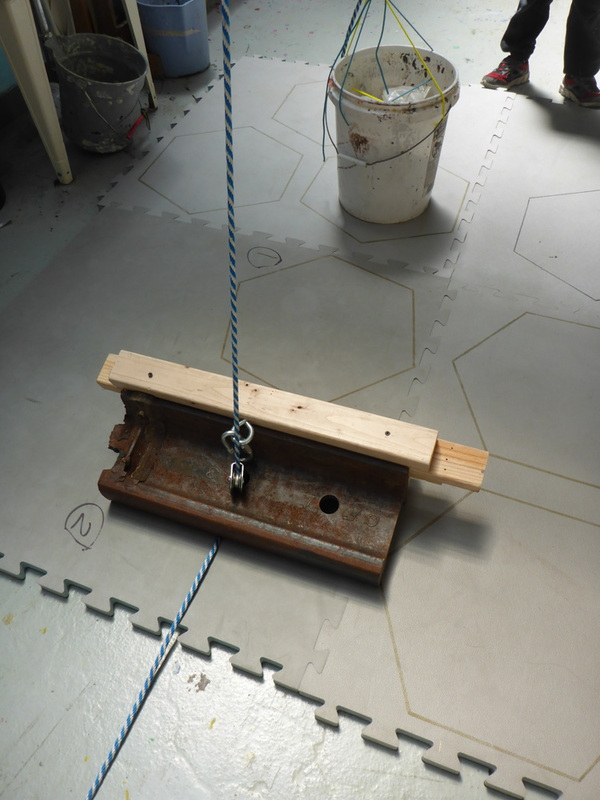 During this workshop, the lifting team was essentially working on designing and testing a block and tackle pulley system. We started by lifting a platform that we designed and built. Then we used the platform to lift a cinder block. Then two cinder blocks. And then, at the end we lifted the gator! What an awesome day! Thanks everyone! Check out all the photos on Flickr! In the shop, we have a Ziplock bag of these bizarre ping pong balls with a face on them. (We have no idea whose face this is, so I apologize in advance if you stumble across this post and find your face on a ping pong ball!) For this workshop, we designed a multi-tiered interactive challenge for the attendees. After a morning of tool training and practice, we introduced the project that we would all be working on together for the rest of the day. 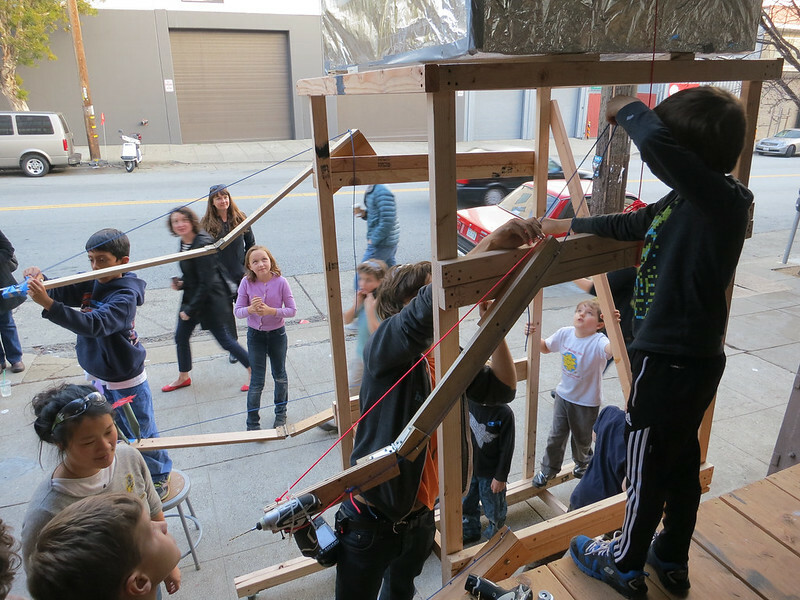 A Zoo Playground was our prompt -- but how we arrived at its implementation was not so simple. As a group, we began by brainstorming the types of VERBS we do at the playground. 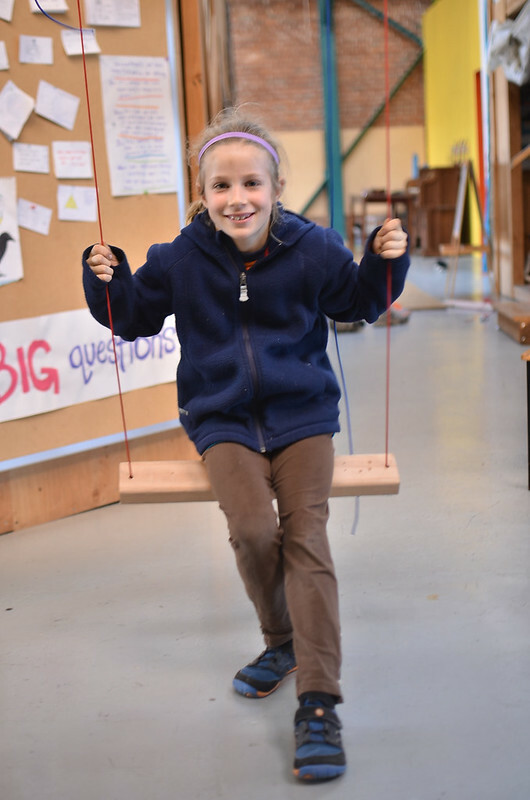 Everyone closed their eyes and imagined their last trip to a playground -- what was the weather, who were you with, how did you feel, and what were you doing? 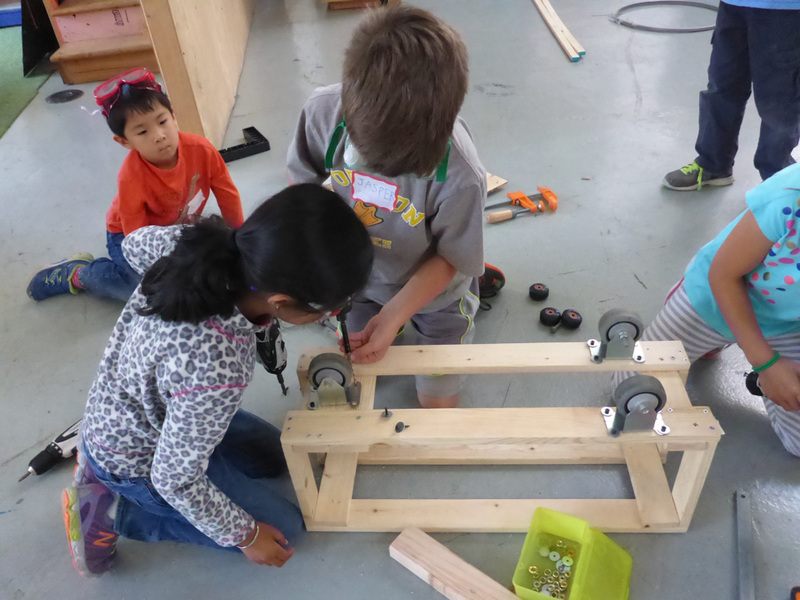 This past weekend, Tinkering School hosted a special session of English Language Learners from China. We had been coordinating this session for a couple of months, and the preparation involved lots of chatting between our Director Karen and the Program's Manager in China. They corresponded mostly about TS vocabulary words and concepts to help prepare the students for the loads of information they would received at the workshop about how to use the tools and how to treat one another and the space while at TS. 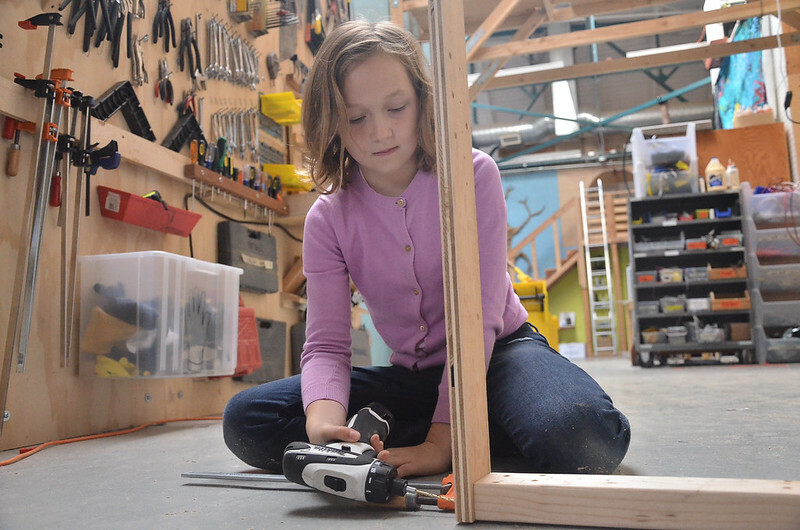 Build a Vending Machine in One Day? Okay! 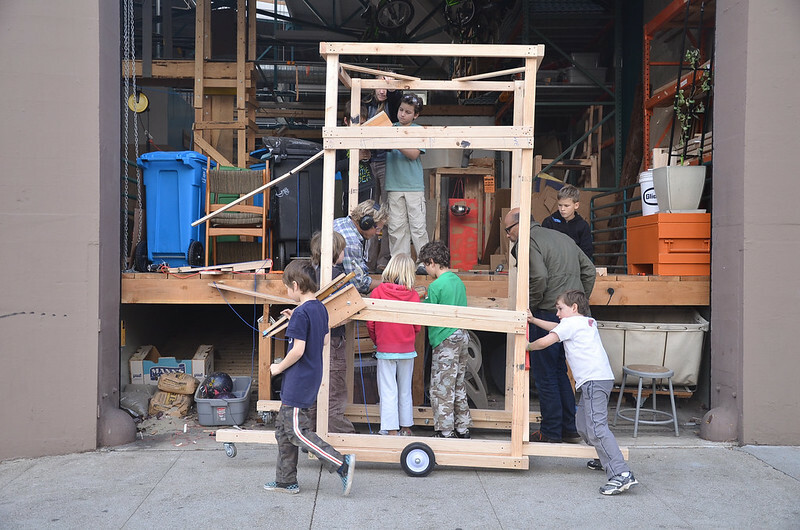 One day, 16 Tinkerers, and one working vending machine? No problem. 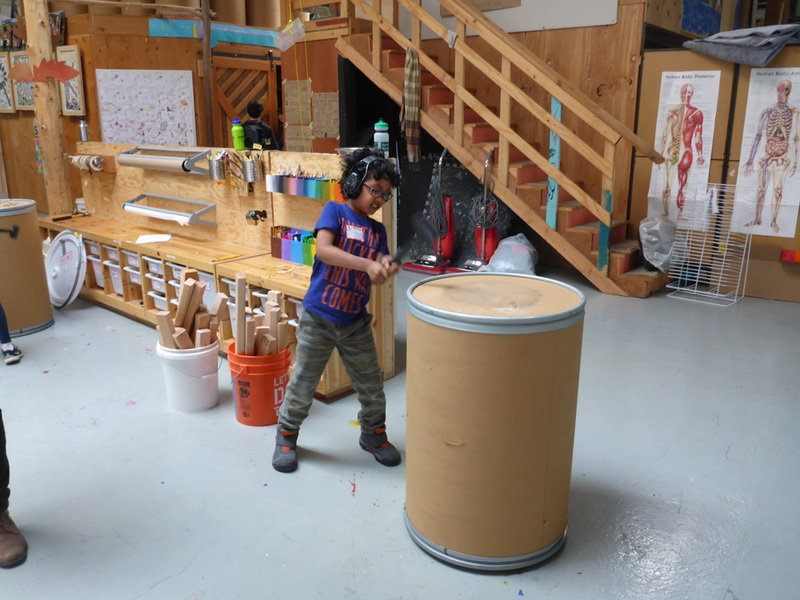 At today's One Day Workshop, we began by using a 19" diameter plywood circle. The function of this amazing object? Well, today it was a quarter. That's right. Twenty-five cents. With that twenty-five cents, we will vend something. Easy, right? All we have to do is make something to accept the coin, build a mechanism that tells something to dispense and also build a thing that holds the something being dispensed. 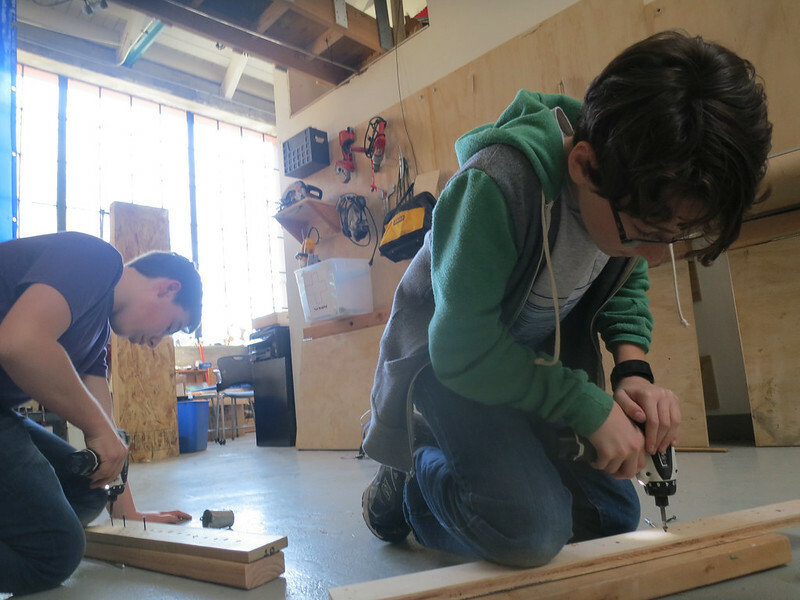 In order to make all these amazing things happen, first we had to learn to use the tools. Piper and Mira show off their shape-shifting parallelogram. Jay practices drilling with teammates to make some rectangles. 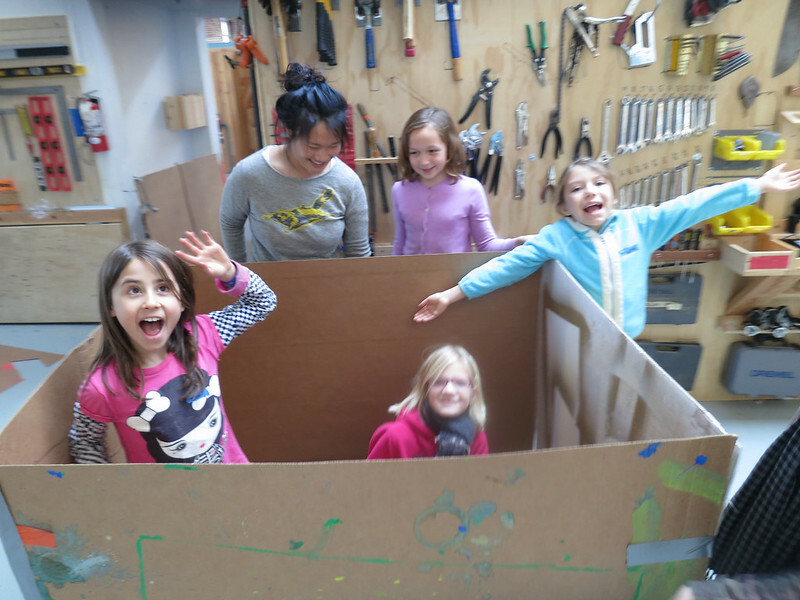 One team worked on making a giant cube for all the vending machine components to fit inside. We had some amazing teamwork today! 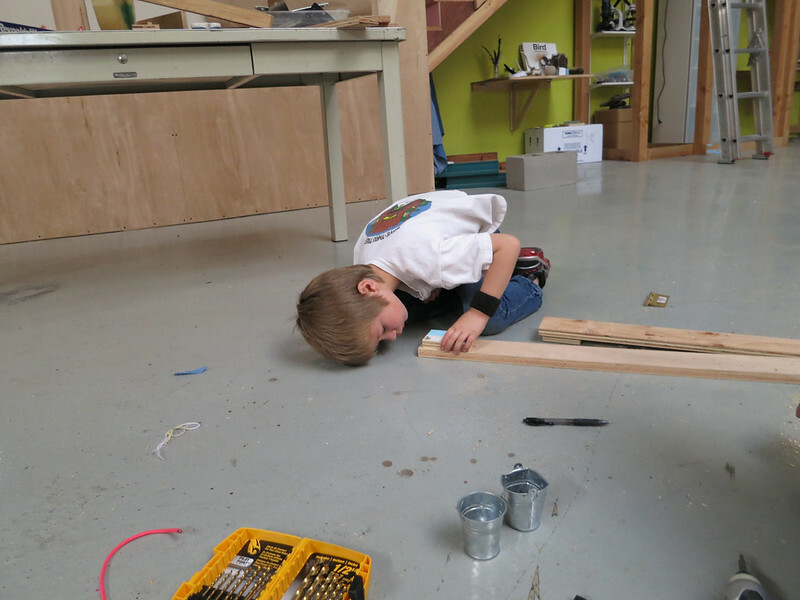 Matthew and Turin worked together to build the base of a ramp. 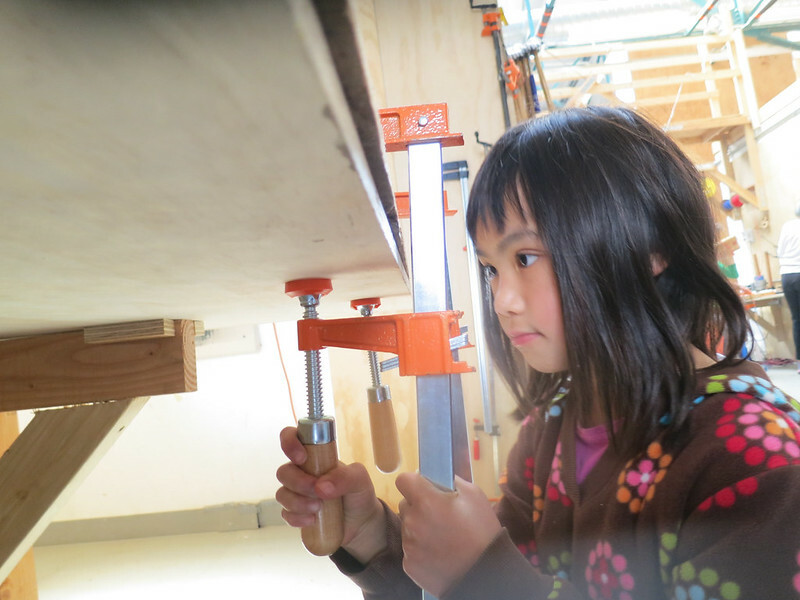 More great teamwork from the ramp team: Lena helps Ronin line up a screw to drive in. 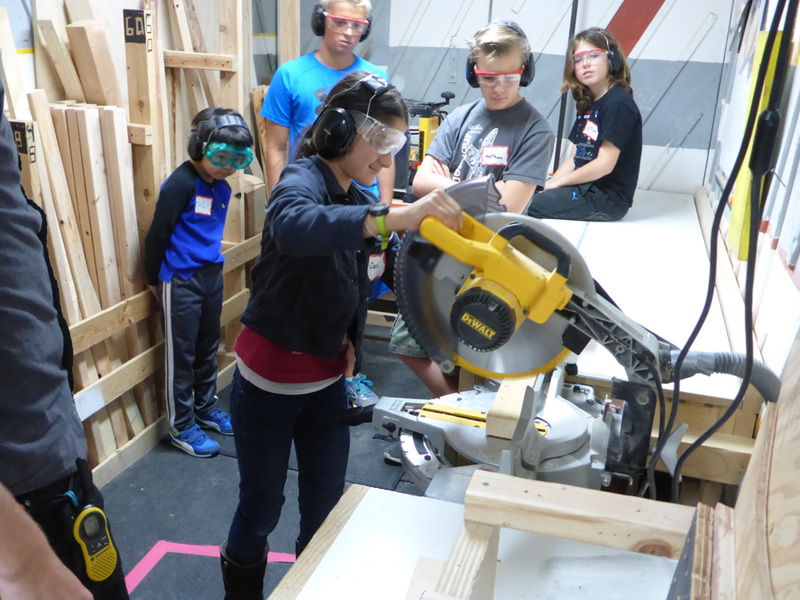 Lyosha concentrates super hard at lining up a cut on the bandsaw with the help of Matthew and Lena. 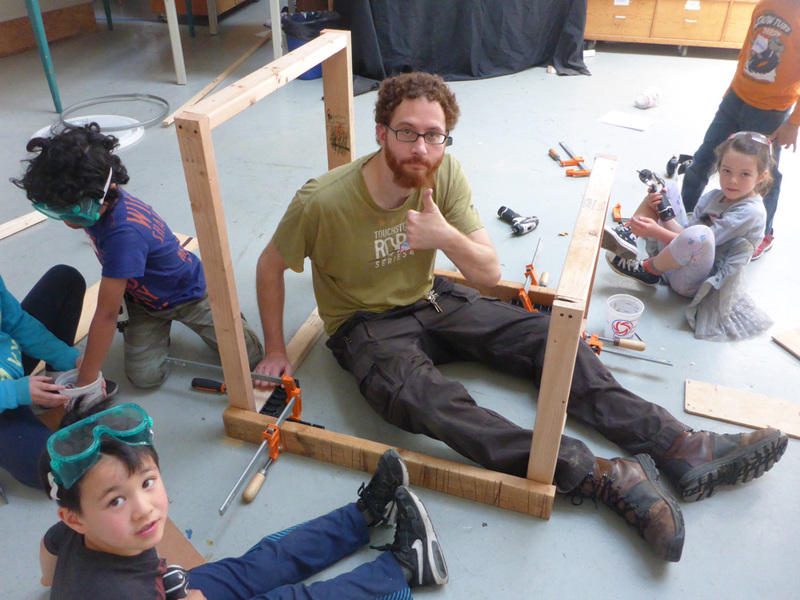 All hands on deck as the ramp team clamps down some railing to prevent the giant coin from toppling over. One of the many coin rolling tests of the day! We set up some really complicated bandsaw cuts today. 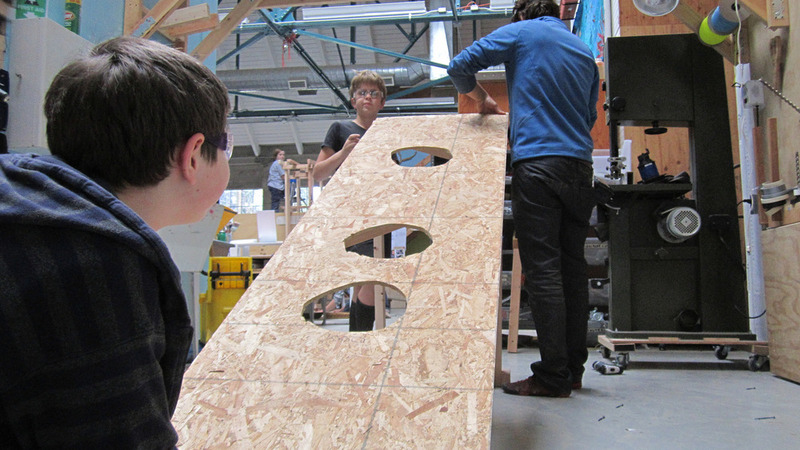 The team worked together at the last minute to cut a coin slot from a single piece of plywood. More bandsaw concentration from Turin. 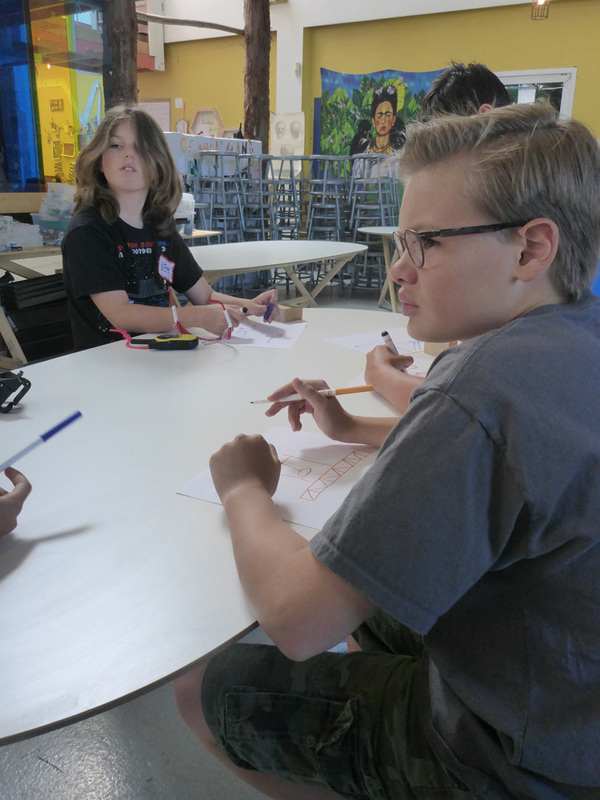 During the design session, all the Tinkerers discussed the complications of the project and tried to come up with solutions to test out as a team. At the end of the session, the whole team came together to try to make the machine vend pencils. (Oh yeah, we decided that for one giant quarter, you could get one pencil. Check out all the photos from the whole day on our Flickr Album. 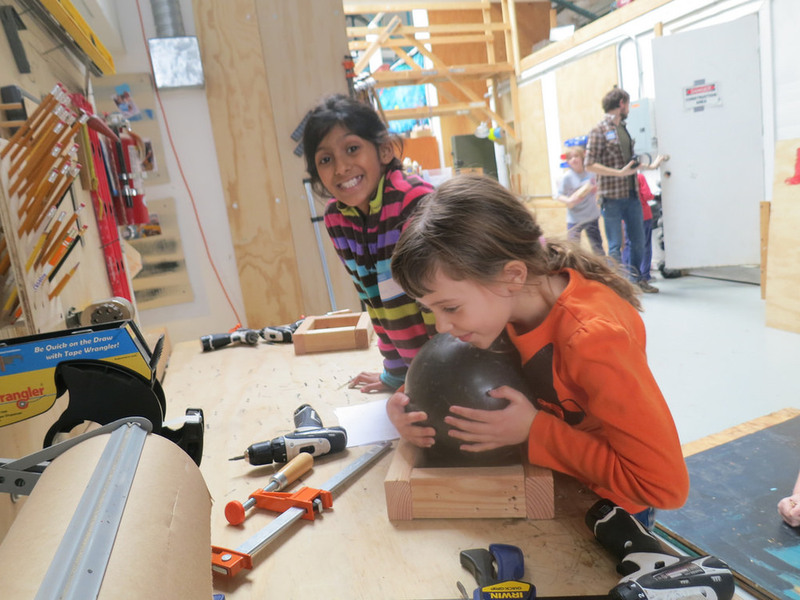 Another Tinkering season has begun!!!!! Today was our first One Day Workshop of the '16/'17 school year! 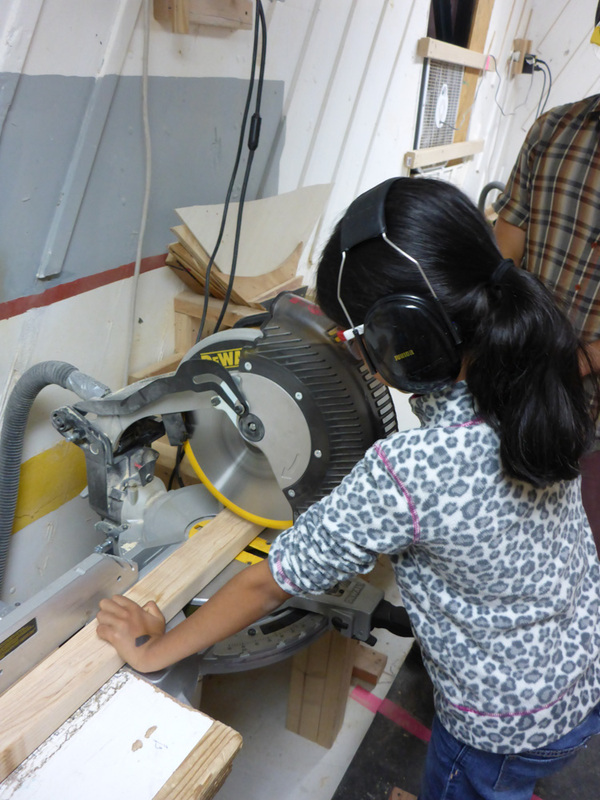 Lindsay helps Gurneet get to know what will become his favorite tool of the day - the Chopsaw! We spent the first part of the morning getting to know each other by inventing Candy Bats and asking each other what kind of candy you'd be made of if you were a Candy Bat - then learning how to use the saw, drills and clamps! Then time for snack and a challenge! ...A Pterodactyl that's been trying to get a hug from a tinkerer for months! Todays the day Pterodactyl! You're getting hugged! 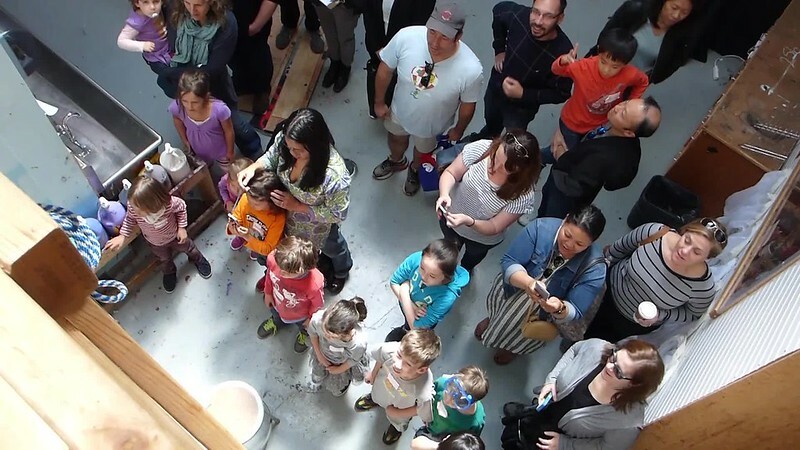 Todays tinkerers are going to figure out how to meet you up there in the rafters and give you some love! Niki explains his hovering magnet board. 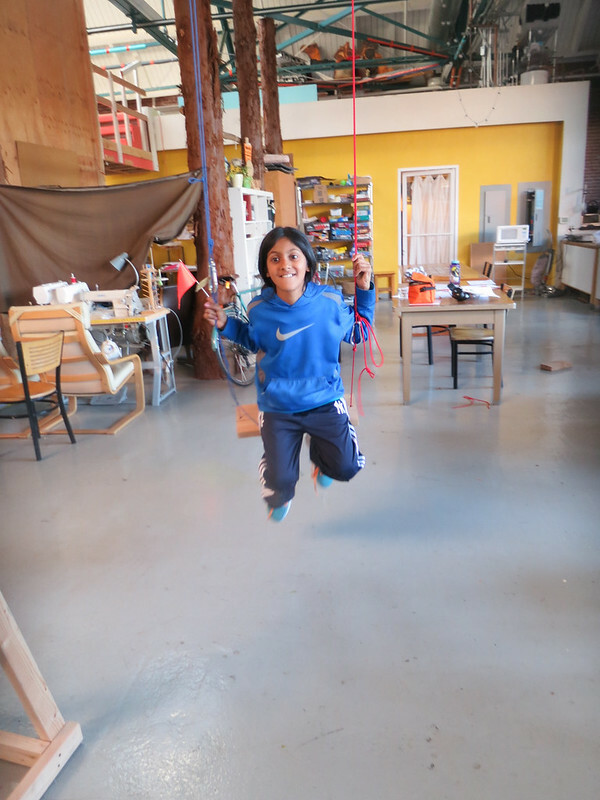 Niki does the final design drawing of our goal for the day - Giant steps! Lucia and Gurneet cut pieces for the team for most of the day! Kids keeping track of the cuts! Niki and Dee add triangles for strength! CoopDog shows Sebbie how to use the Chuck Drill! Steps #1 and #2 hanging out and getting a step installed. Niki and Sebbie installing a mini step on the Giant step! We worked hard all day. We worked together all day. We got to hug a Pterodactyl today. For more photos from the day visit the Flickr album. THIS WAS THE MOMENT WE WERE ALL LOOKING FORWARD TO! 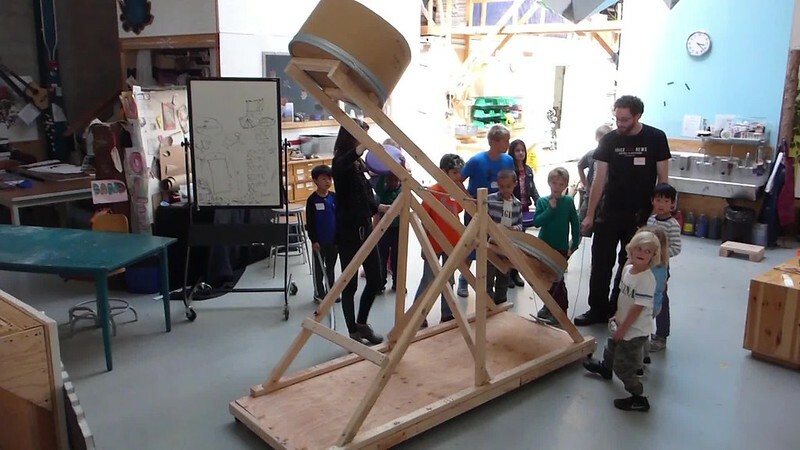 ... to test our pancake launcher against the mean, hungry giants! So how did we get here? Well, it was a super productive day right from the very beginning. 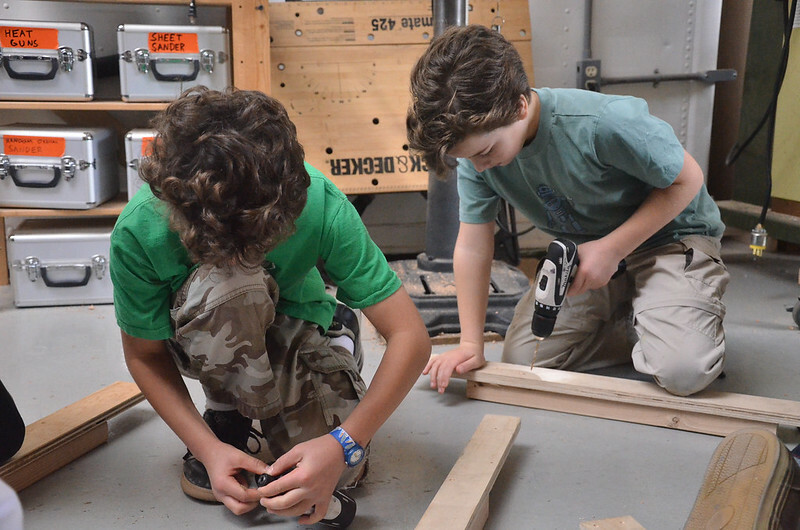 Like every Tinkering School workshop, we start out with tool trainings. 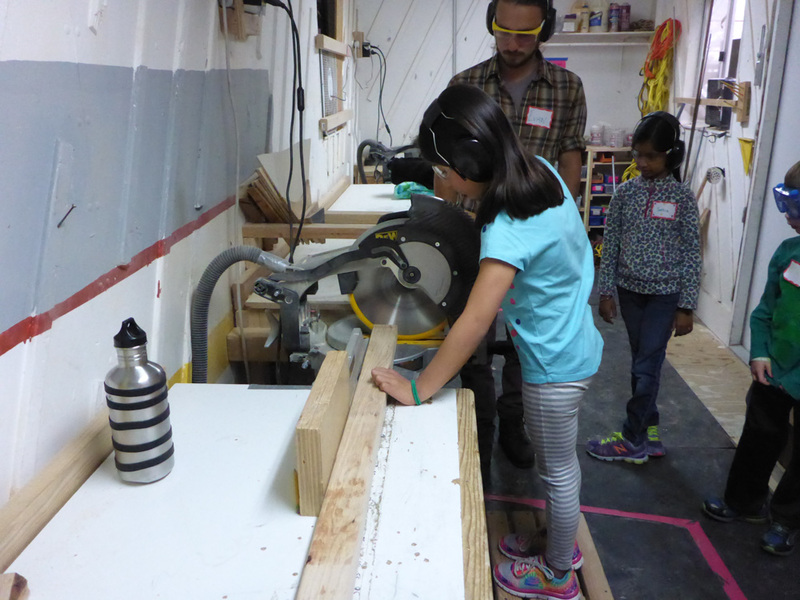 Below, we all got to use the compound miter saw (aka chop saw). 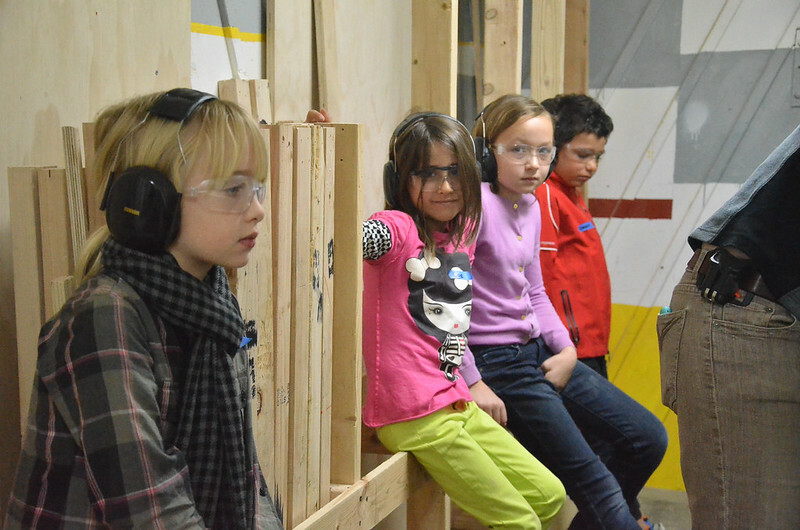 We also practiced drilling! Here's Zen crushing it. After tool training we dove right into project design. We heard a crazy story about creatures who lived here long ago and their fight against giants! To survive, they had to fling pancakes at them! So how were we going to prepare for the giants? How would we fling our pancakes??? 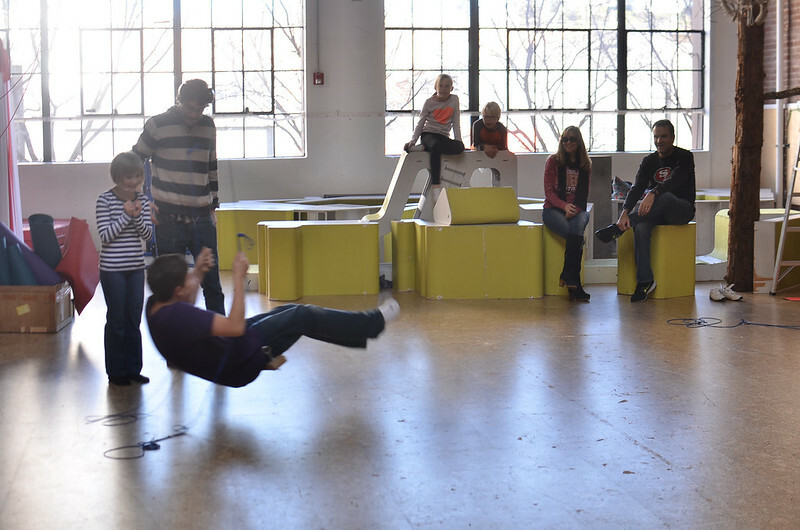 And ultimately decided on a catapult, broke into teams, and got started! 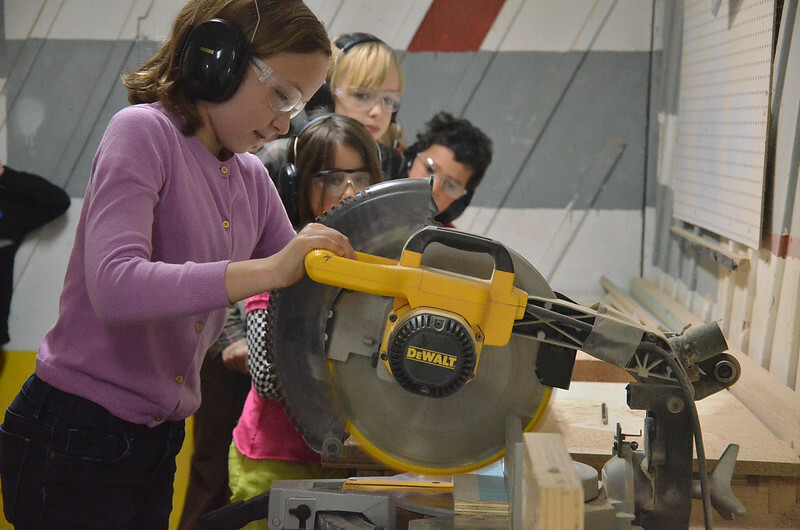 We were super stoked to also learn how to use the circular saw! YEAAAAAAAHHHHH! Henry: "We probably don't need this." Here's almost everyone lending a hand so we could thread our axel across the supports. So cool to see it all coming together! 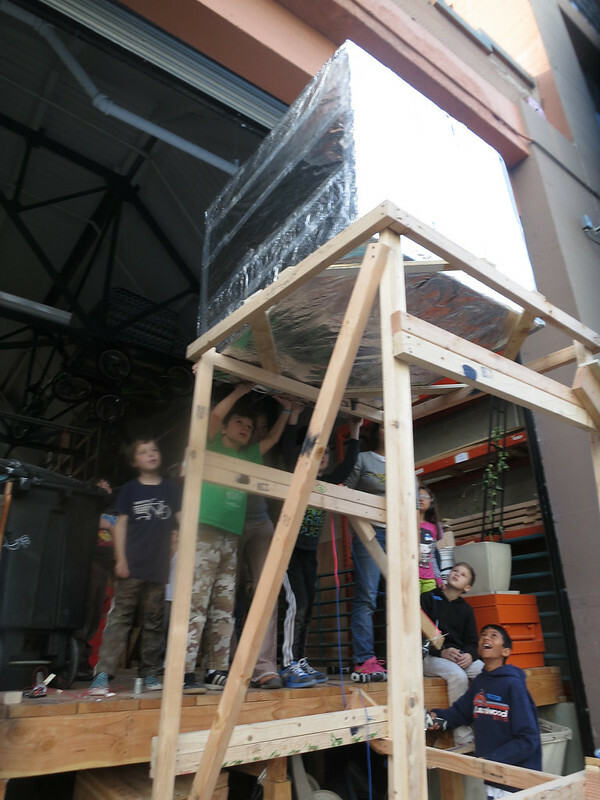 Entire group: "We need something super heavy to weigh it down!" Me: "How about this segment of railroad track?" Me: "How do we feel about this? Is this safe?" We changed the weight to be a stack of wood screwed into the base. We needed targets. Grace drew us a cheetah. So how did it turn out??? Watch below! As always, find more images on our Flickr account! I think it's important to point out that the brainstorm for this workshop started a bit like this. 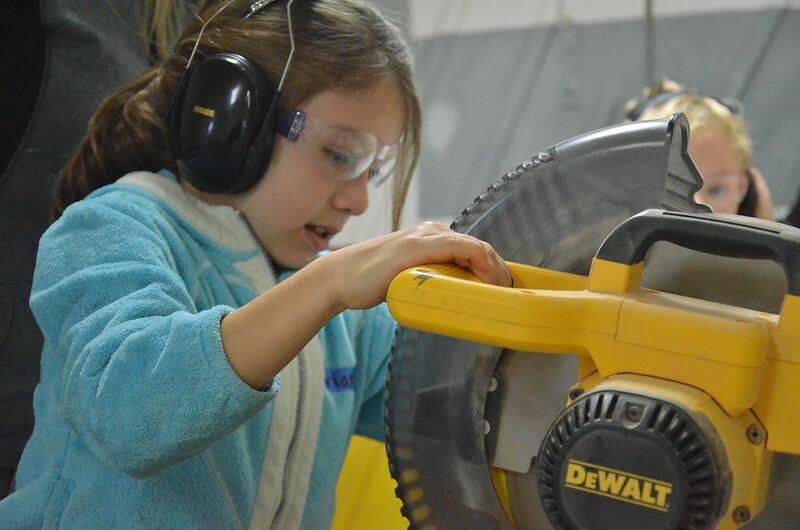 Suffice it to say, we LOVE all girls workshops! They're such a great introduction to the space, materials, instructors and pedagogy here at 1960 Bryant St., and today was no exception. 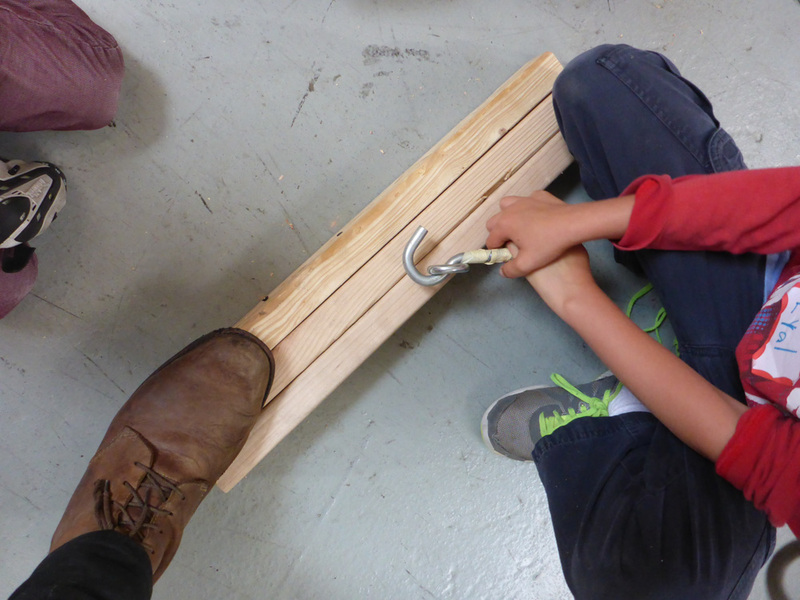 We decided to go with a challenge for today's workshop: tie a pair of shoes from 10' away. Holy woah. The day started like any other: some coffee talk around the nametag table, then we spent some time practicing with the tools we'd be using for the rest of the day. 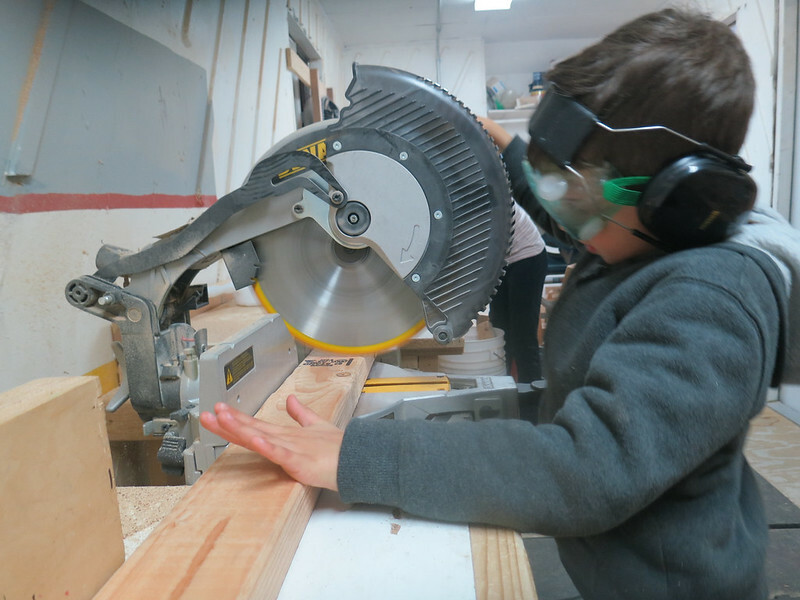 Lily mindfully practices using the chopsaw. All of us practicing drillz together. Then we ate some snacks and talked about tying shoes from far away and then started playing with rope and chopsticks to see if we could tie shoes with less than 5 fingers. It was pretty silly and fun! Lindsay, Amanda, Olivia and Anna try to tie a length of paracord around a water bottle just using pencils as chopsticks. At some point we decided we should actually decide what the steps are to tie shoelaces. 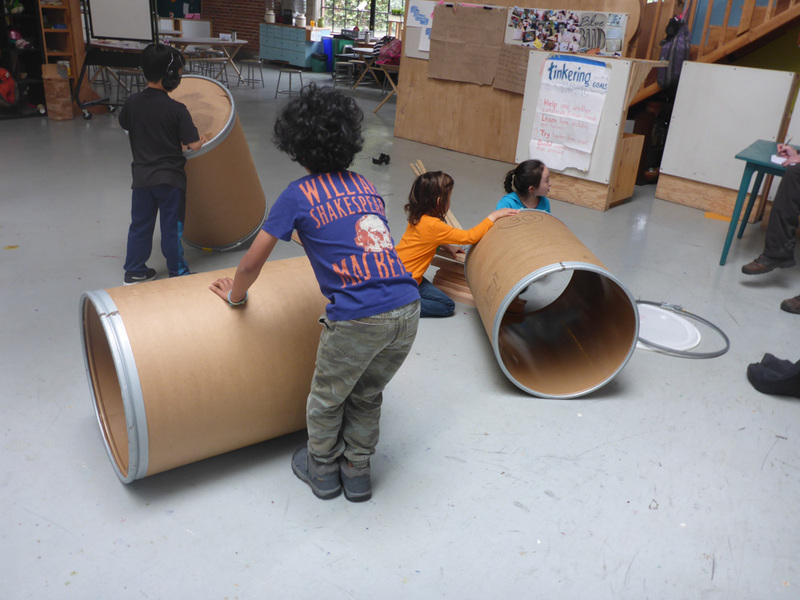 We decided that we needed to split into two teams: one to work on making 'hands,' and one to work on making a structure to support the hands and arms. Then we got to work! Olivia, Beatrice and Sophia figure out what the hands actually need to do: grab, pinch, and stick. After eating some lunch, we got back to work, and got down to the real down and dirty of tying knots with (basically) long sticks. In the end, what we really needed to do was PRACTICE, PRACTICE, PRACTICE. Olivia and Sophia became veritable pros at tying knots using long sticks! Lily finishes up adding some supports to the frame of the shoulders. After working really hard on all of the pieces, we upgraded from short to long chopsticks, and had loads of time to practice trying really hard to tie knots using our long chopsticks. Sophia, Amanda, Olivia and Beatrice try to pass the loop through to finish up tying my shoes. It was so great how so many girls jumped in to help lift up the weight of the chopsticks to help the lace-tiers out. You can see SO MANY MORE pictures from the day on our flickr--check it out! 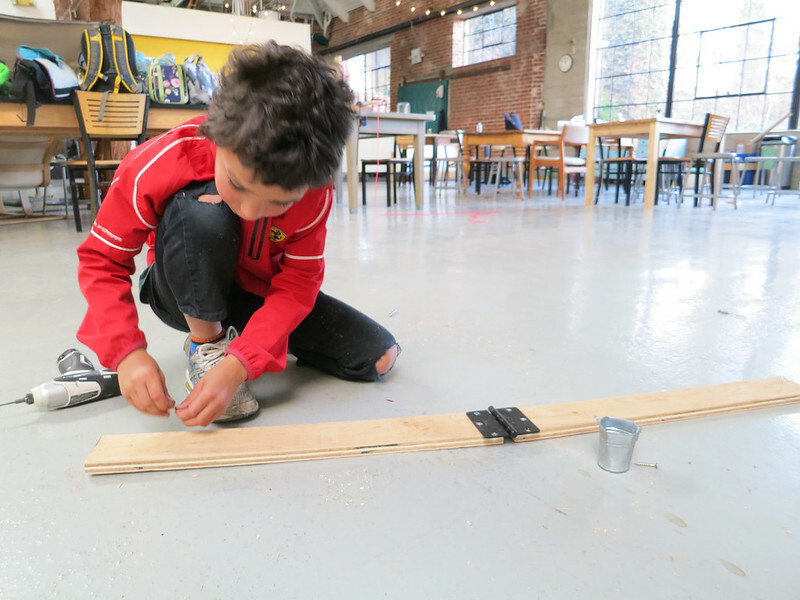 Today, mere hours after a section of the no-longer-in-use half of the old Bay Bridge was carefully imploded as part of its deconstruction process, we at the Tinkering School, with bridges on the brain, decided to design a bridge that would never need to be imploded, because it would be set up to be moved when needed. After getting familiar with the tools and community agreements, we set out to design a bridge that would always start from point A, but could be swivel or shifted somehow so that a bridge crosser could wind up at either point B or point C. A whole range of exciting ideas emerged, condensing into a design for a bridge with a stationary half and an attached mobile half that would be wheeled and would swivel. And then we set to work, and we worked hard right up until the moment parents and families arrived. Today was amazing because we didn't finish. We chose a really ambitious design, pushed ourselves to try really hard, and didn't settle for something that we weren't excited about. 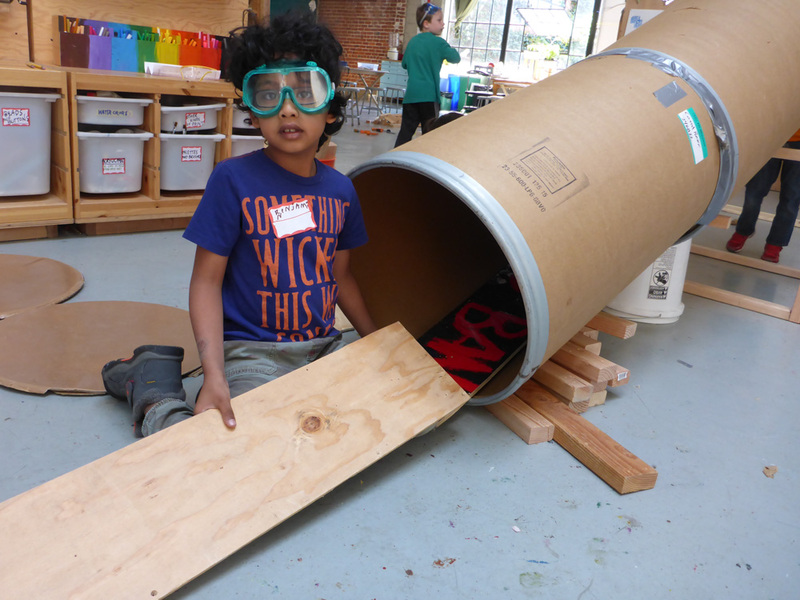 And even though we didn't finish, we met all our Tinkering School goals, and kids also acted super kindly towards one another, and stayed patient and excited about a project they knew they might not get to fully complete. Since this kind of thing happens all the time in life, the skills to be flexible and still collaborate in the face of unexpected delays are definitely great to find, especially while having so much fun. 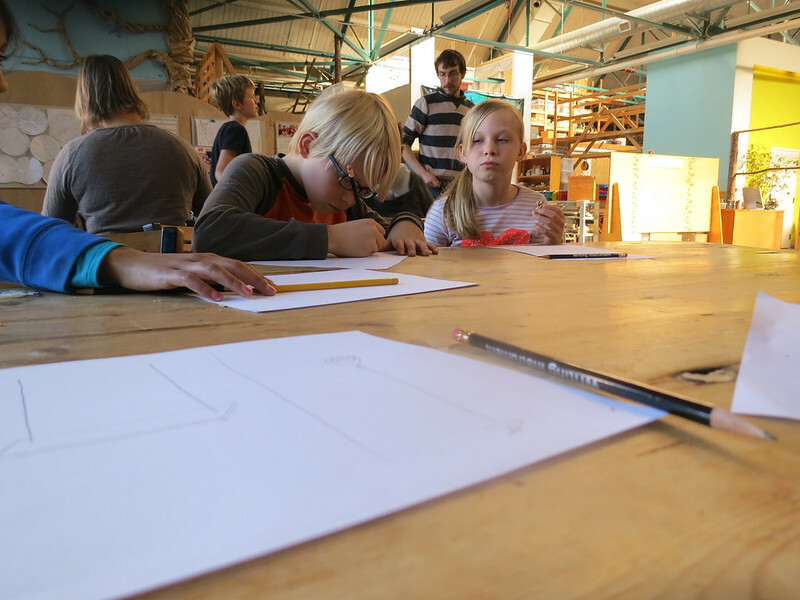 It was a sunny morning when we arrived at Tinkering School today, and the energy in the room was calm and curious. Folks had come from down the street, and from as far away as Colorado (! ), to collaborate and build together. After a solid round of tool trainings and practice, we circled up to learn that our project today was: to build a forklift together! 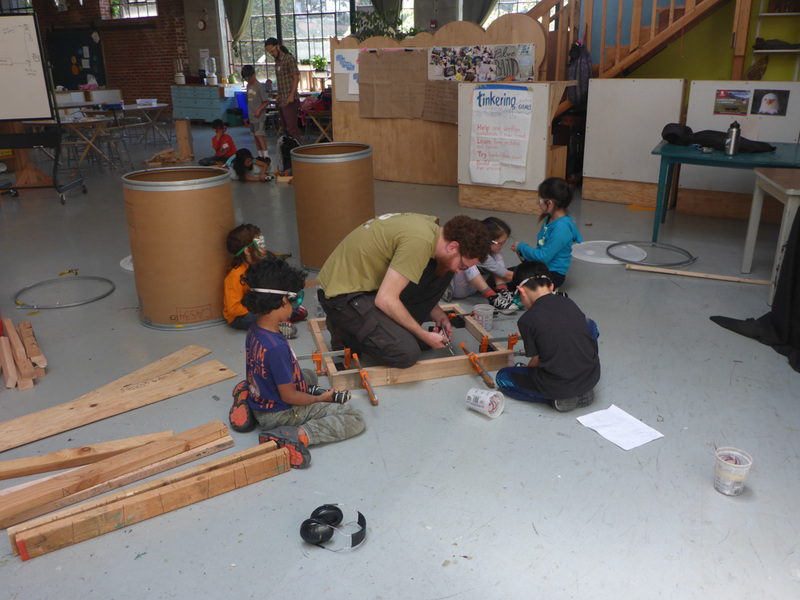 This immediately led to one of the more complex and layered design sessions I've seen a group work through at the Tinkering School, and they did so with patience and interest, sharing the conversation amongst many people and making some, in my personal opinion, excellent puns ("can we build a giant fork for the fork lift to lift?") 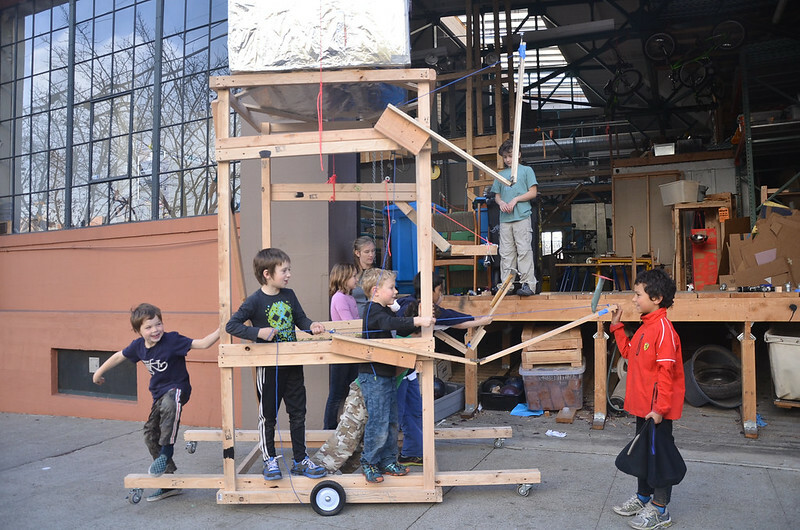 The design fleshed out slowly, breaking into three groups who then went into even more detail and began building the car body, the lift and pulley system, and a counterweight system (so our fork-lift wouldn't become a human-squish). And then the work really started. And it kept going. And kept going. Right up until families arrived, tinkerers worked hard, problem-solved unexpected challenges (the bowling ball counterweights are rolling around and rogue-steering the car; the lift mechanism is trying to escape its tracks; this cleat is trying to wiggle away), and held focus and a good attitude towards a mentally fascinating and exhausting set of tinkering problems. At the end of the day, we talked about specific moments or takeaways that we were going to remember from today. 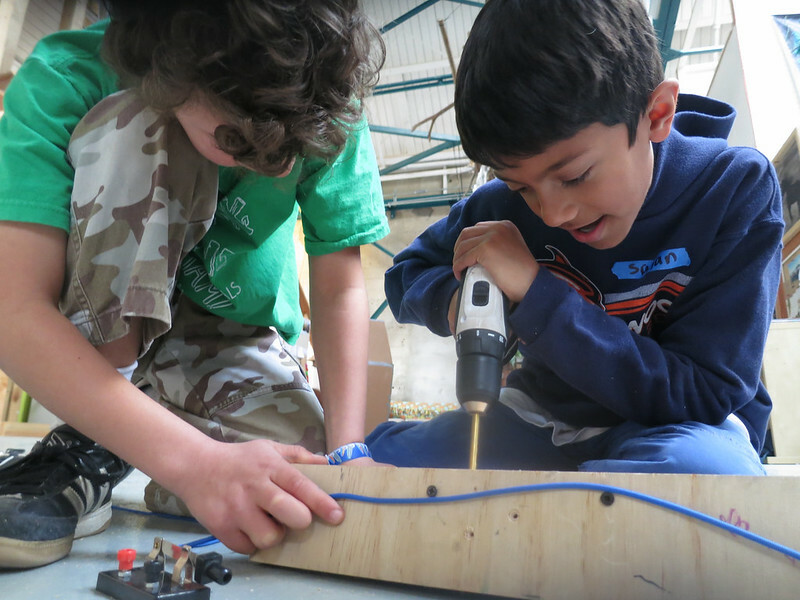 For me, the thing I was most struck by was the level of kind and extremely complex communication tinkerers used with one another today. 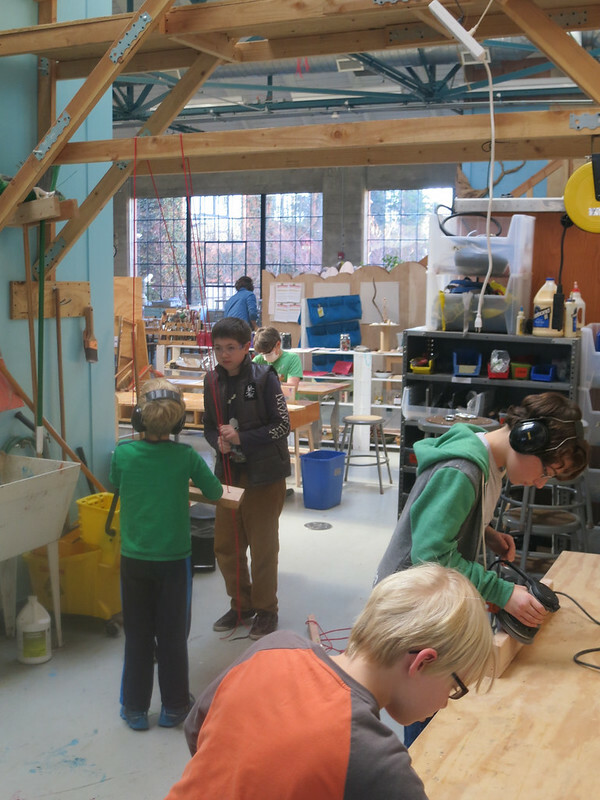 I love feeling extraneous at the Tinkering School, knowing that I can step back and be a silent safety net, because it means the tinkerers are talking to each other and building together so effectively. And even when our forklift stuck a little bit at the last minute, folks continued with their friendly attitudes and excitement to problem-solve. Next time maybe we can even lift up some actual forks. More stories from our last day will be posted next week. Some photos are already up on our flickr. Today we faced three challenges. Around, Over, and Across. The goals were all simple in presentation, and delightful in execution. We needed to get one bowling ball around an 8 foot long wall, another over a 6 foot high wall, and send yet another bowling ball through the air across the distance of a yoga matt. The primary restriction was to not touch the ball while it was accomplishing the goal. Around was deceptive as a challenge. So easy did it seem that very few kids joined the team working on the project. Oh how wrong we all were. Getting a bowling ball to roll, take a 90 degree turn around a wall and return was a miniature feat of engineering. 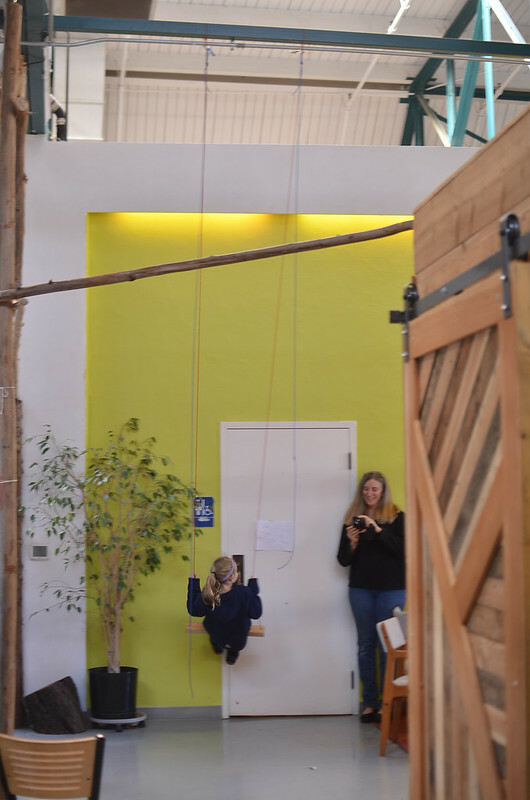 Over was a challenge with a playful solution involving two pulley elevators and an "emergency string". Oh, and an emergency stick for the times it didn't quite work. Across was a spectacle. You can see a video here. No harder or easier than the others, but substantially less subtle. 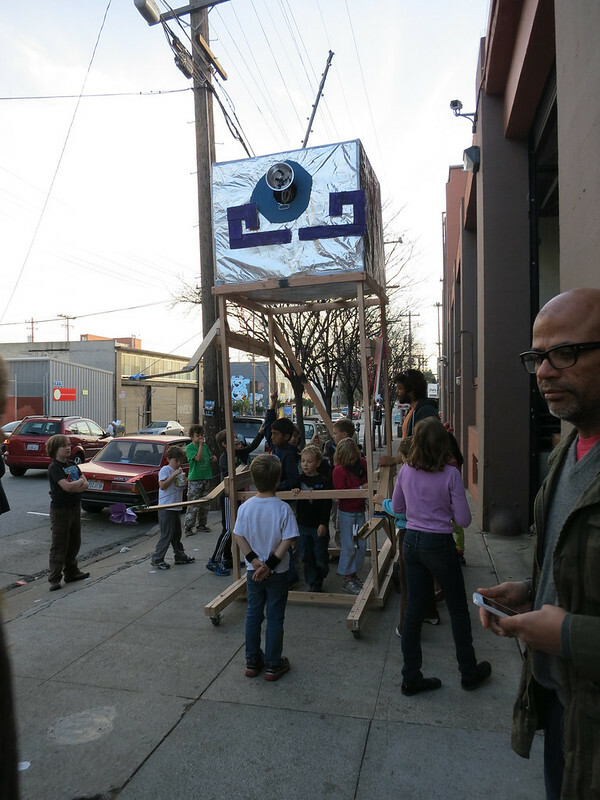 Starting at 8ft high a ball careened down a track, over a plywood ramp and past a 6 foot long yoga matt. 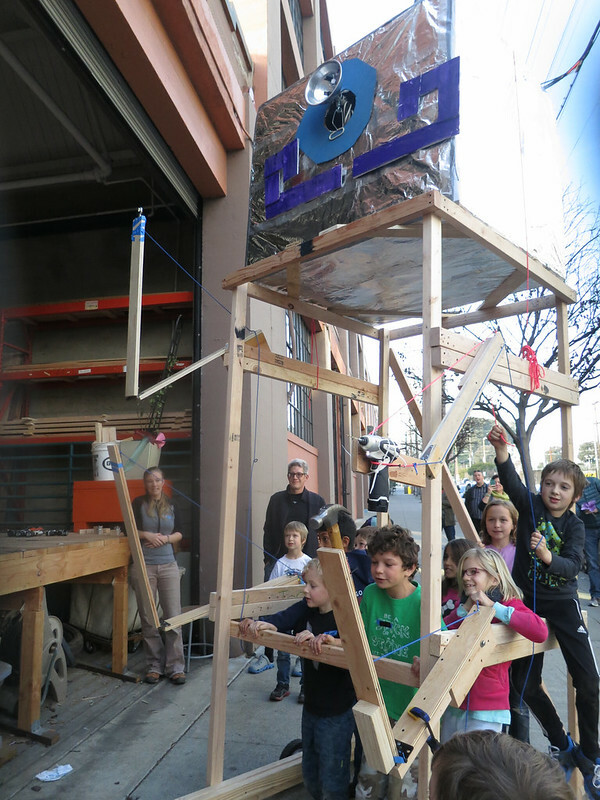 We later added a ski-ball element that was startlingly satisfying to play with. We devised ball holders and planed our own solutions. Our veterans got to use new and more powerful tools. 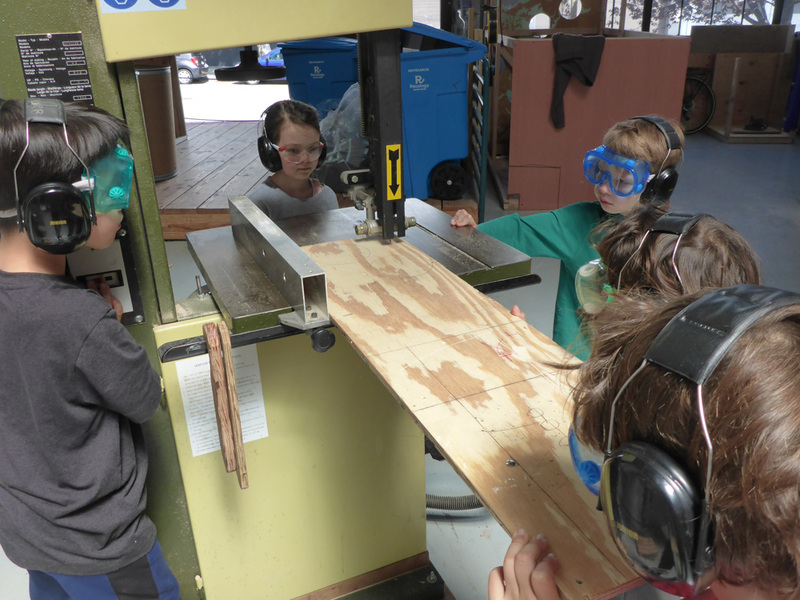 The jig saw is how we cut two pieces of plywood so precisely to create the ramp at the end of the launch. These were the kind of problems that could not be solved alone. Today was full of team work. Likely and unlikely pairs, trios and teams popped up all over the place. The projects pulled us together. Anyone can launch a ball through the air. Launching a ball with precision requires hard thinking, creative problem-solving, and plenty of perseverance. 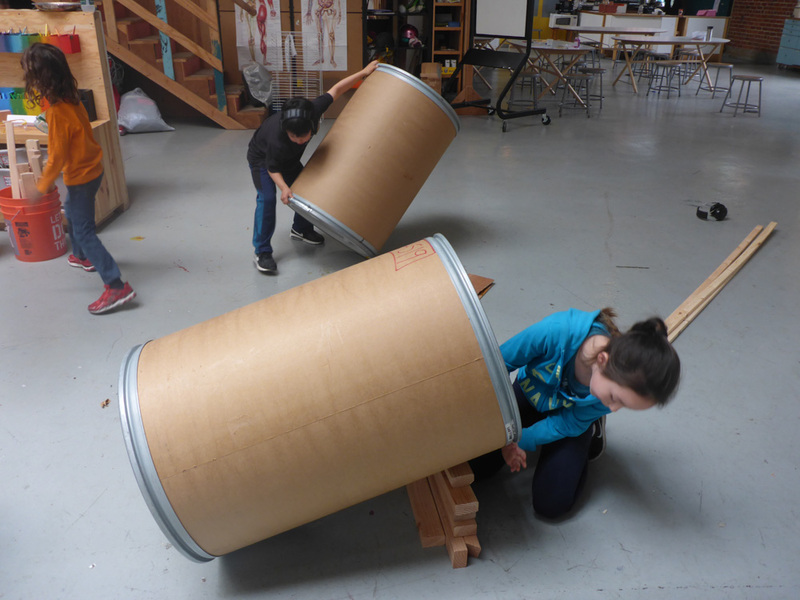 Today we challenged ourselves to create precision projectile launchers. 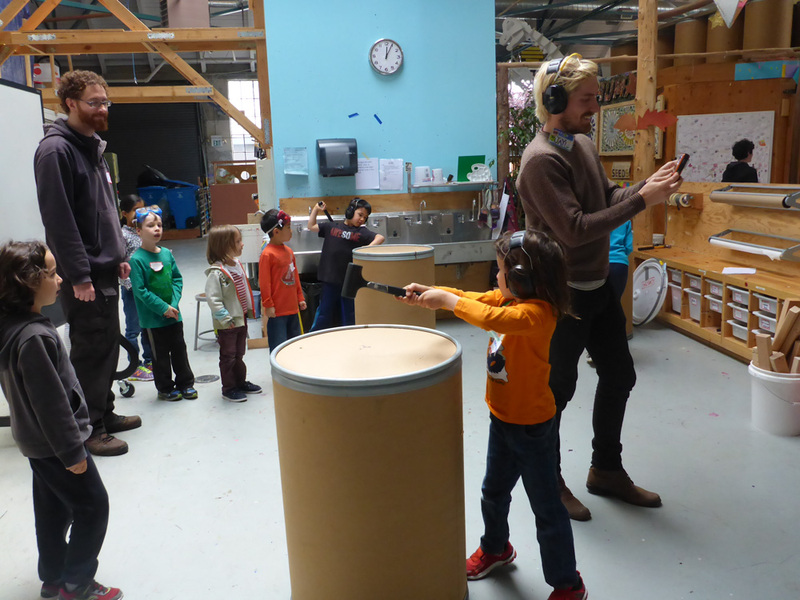 Then we looked at two different ways to launch projectiles--with an arm that rotates about an axis, and with a spring. 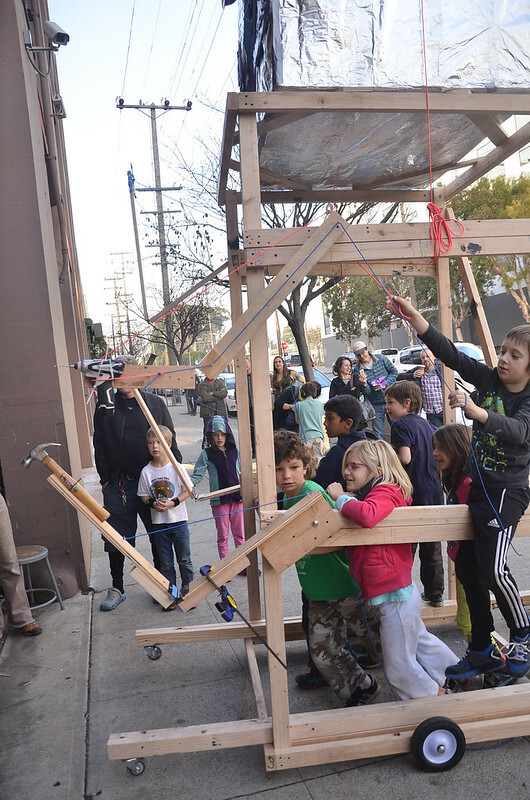 Some builders went even further and created a rope-and-pulley cannon-style launcher! We drew designs over a mid-morning snack, then headed into the workshop! The vibe today was great, marked by awesome teamwork and a real willingness to take a step backwards and fix mistakes (before they became headaches). 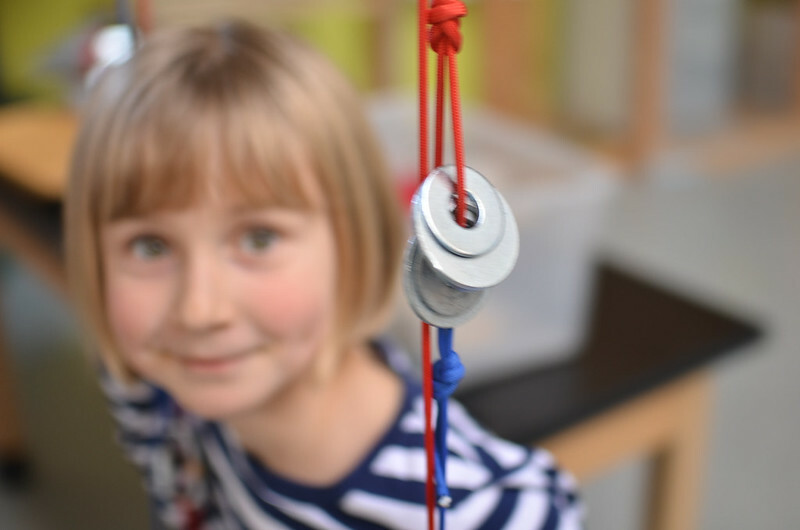 We built a target range with brightly-painted foods dangling from strings and swinging on springs, plus a bullseye with a steel gong! 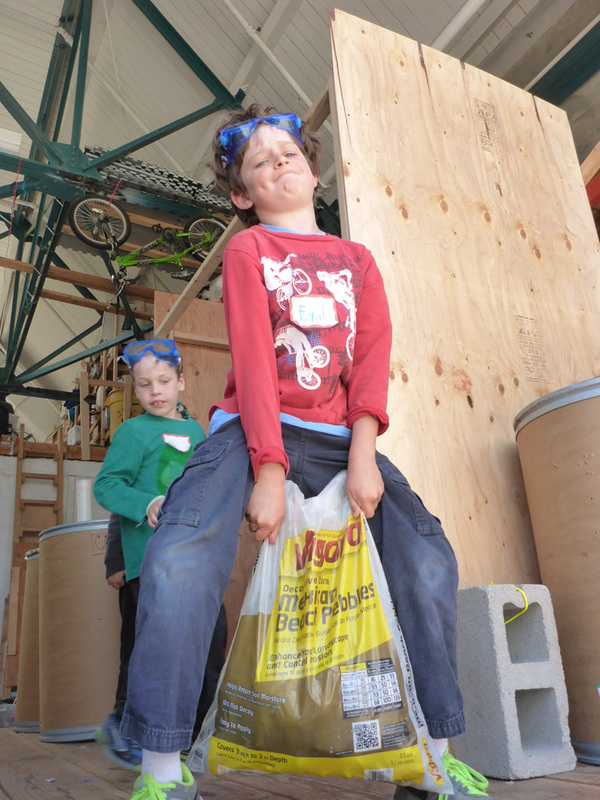 Many thanks to our young builders--keep on refining your launchers, and remember to aim away from windows! Today we took on what sounds like a simple challenge. 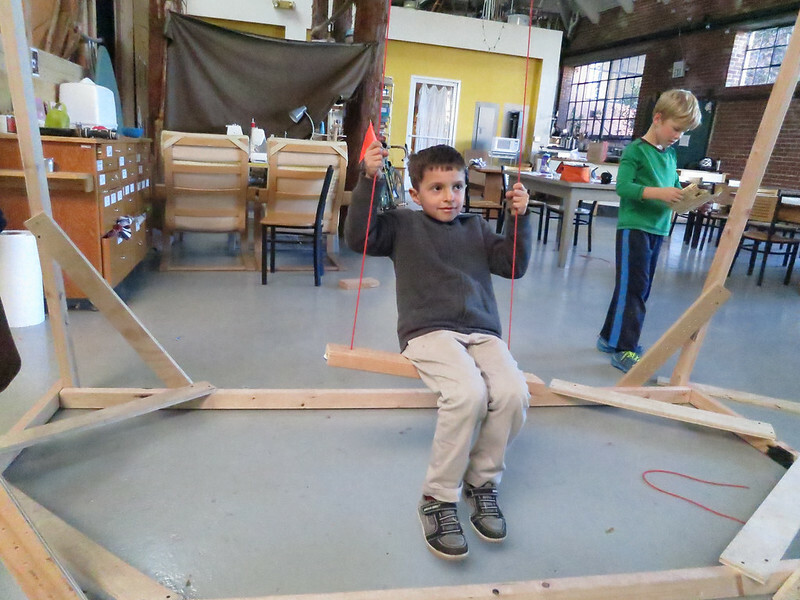 Make a swing that can be put up and taken down anywhere. The putting up is easy if you've got one decently strong looped knot in your mental collection, some rope, a piece of wood and some time to think about it. A swing that can be gotten back down, without climbing the tree or cutting the rope down, is something else entirely. 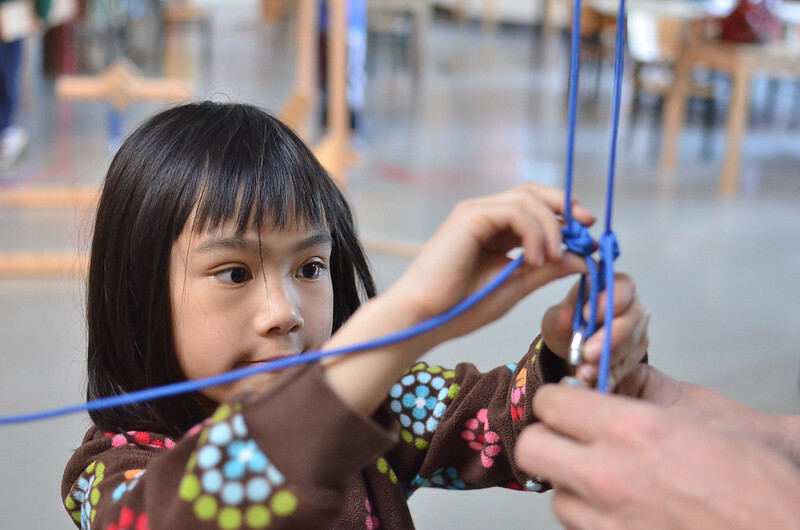 We trained with tools and practiced the figure eight knot. We laid out a design. And we got to work. 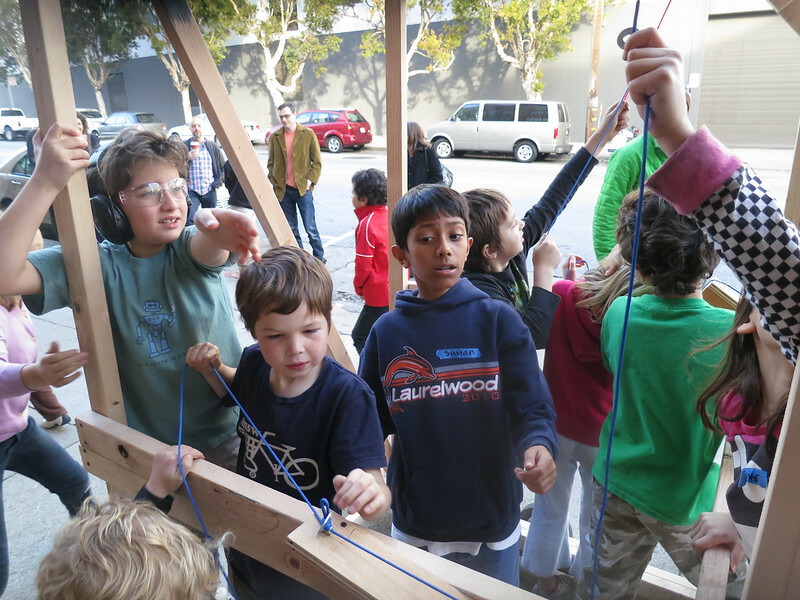 Some kids made their swings to swing on low branches. 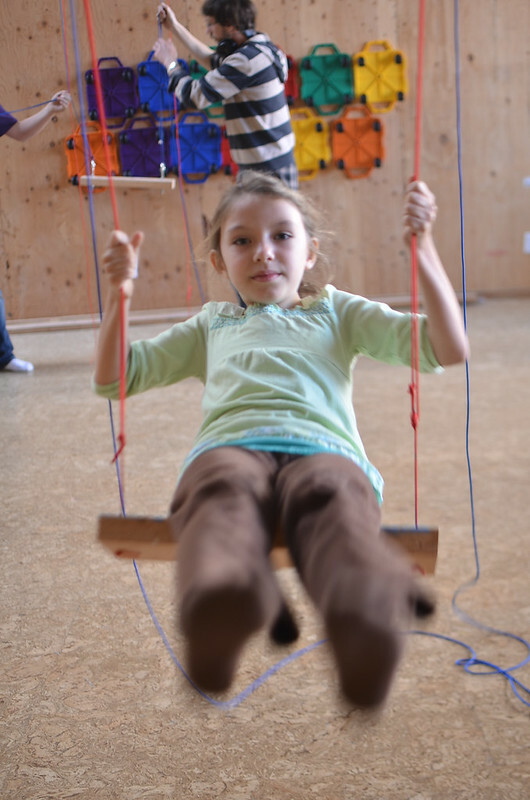 Others made them to swing on high branches. 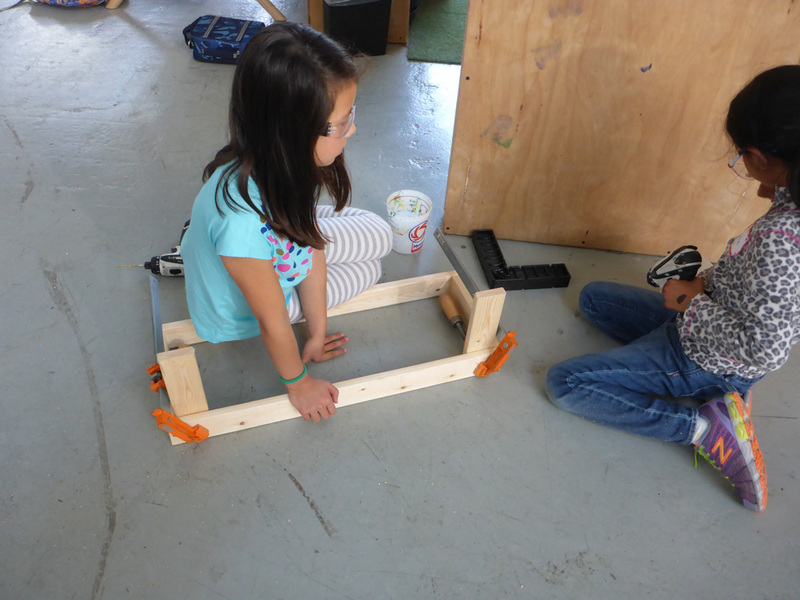 The designs where full of clever solutions dealing with weight and friction. 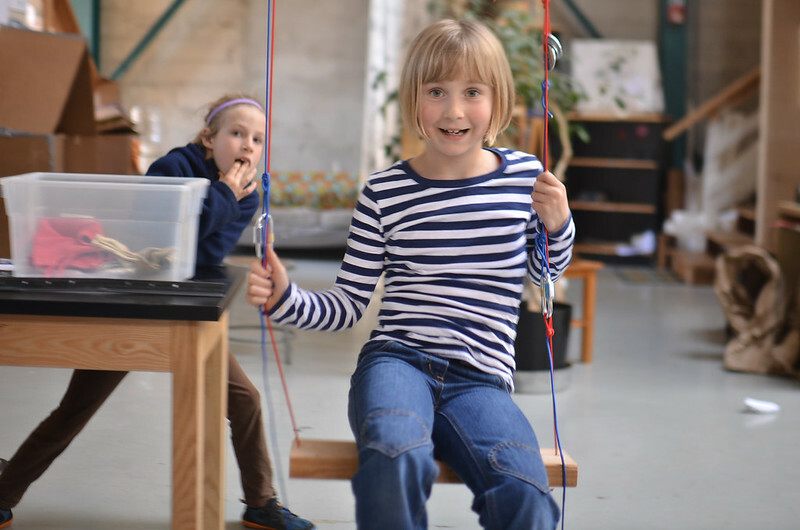 And then we swung on our creations! See more photos on our flickr. 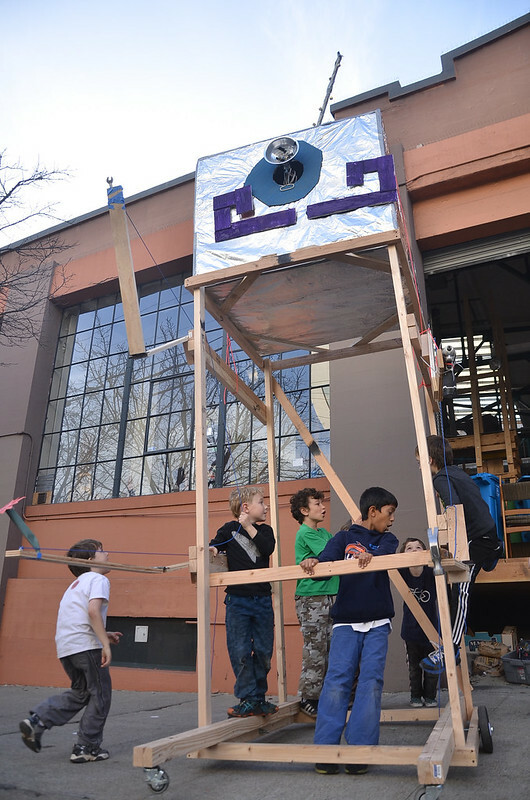 We built a 12' tall robot today. This mustachioed mechanical fiend was a tinkerer by trade. He had 4 mechanical arms, one with a wrench, one with a power drill, one with a hammer, and one carrying flowers. A 4ft head with a light up eye dominated the skyline as a rolling base modeled after a lumber yard truck allowed him to turn on a dime. We started the idea with a simple set of exceptionally vague notions. Josh would work with kids to build a body. Sean Would work with kids to build arms. Nikki would lead a team building a head. Lindsay would be our floater and help any team who needed it. Leaving it that simple and wide open gives us just the right structure (we are definitely building a robot) to keep things moving. A structure that help prevent us from doomed tangents and distracting antics. 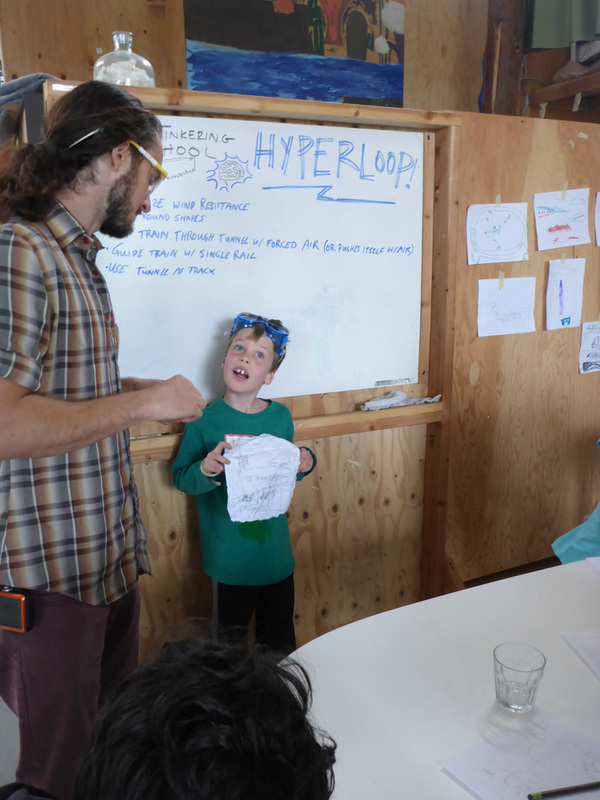 More importantly it gives us tons of freedom to chase the kids ideas. 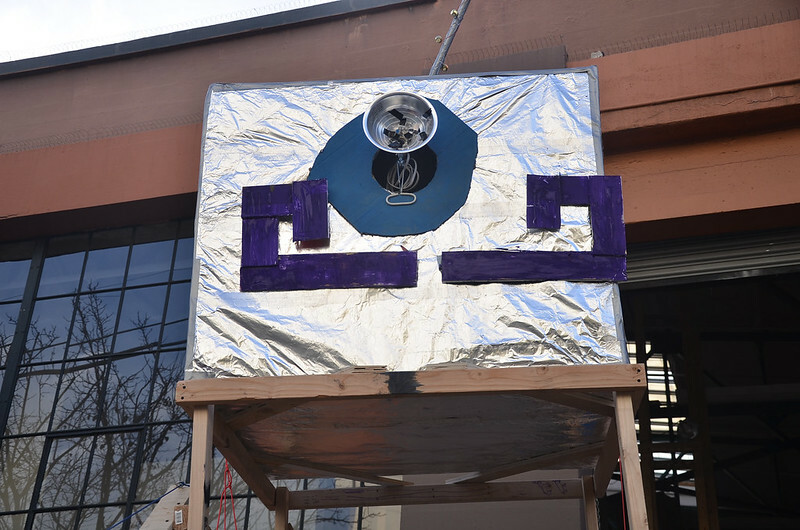 It allowed us to say yes to the wonderfully oversized head and its amazing antenna, mustache and glowing single eye. It let us say yes to a four armed tinkering machine that delivers flowers. 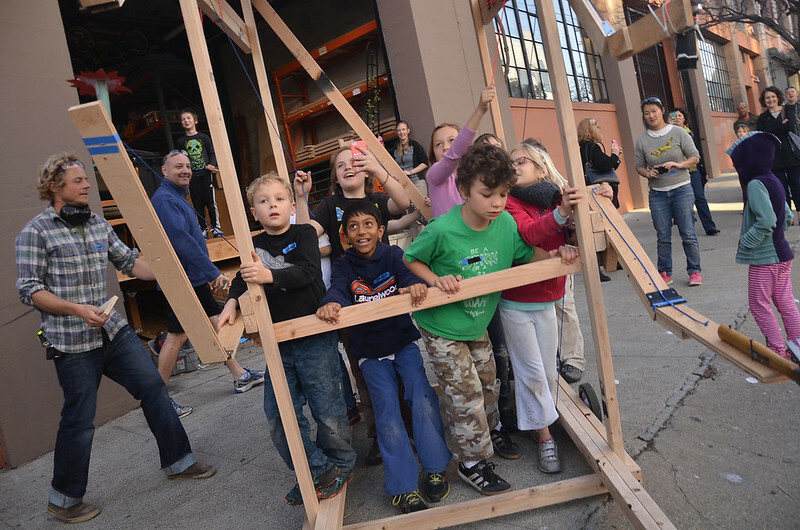 It let us say yes to an 8ft tall torso, making it one of the larger things we have ever built. 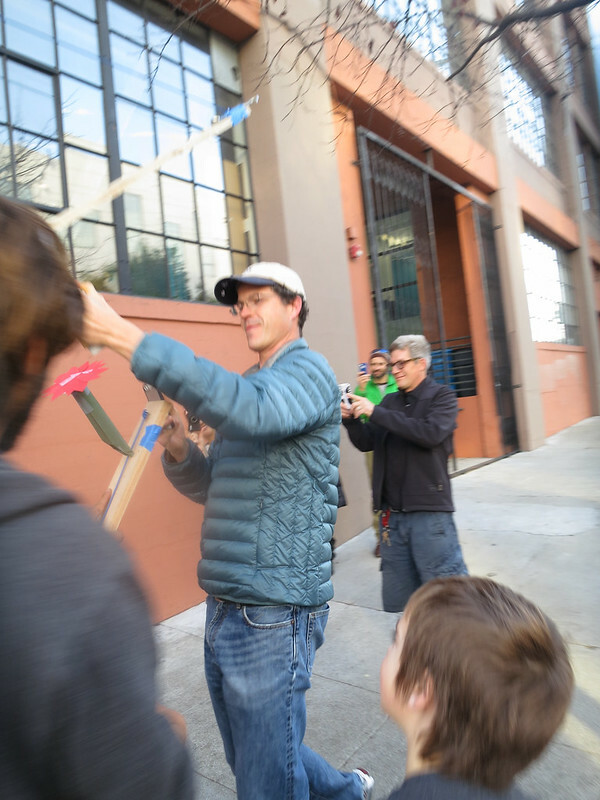 As the day began we practiced with our chop-saw, laying a framework for discussions and opening up potentials. 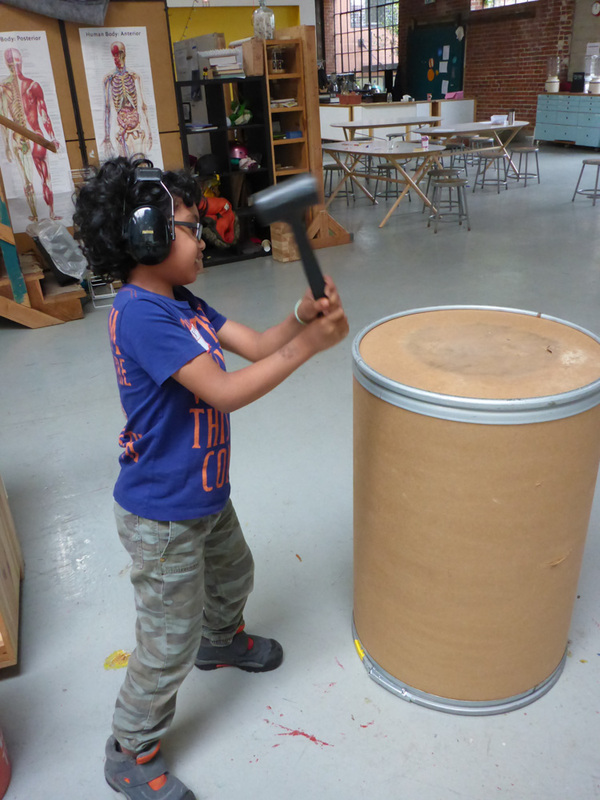 Drills and saws are to building things as drum and guitar are to making music. You could use more, but you really don't need to. We began our day by breaking into the 3 teams (head, arms, body). The team working on the head went big and never looked back. The team working on arms needed all their focus. These would be the most finicky part of the project. As the body took shape we needed to move outside so we could work on it at different levels simultaneously. 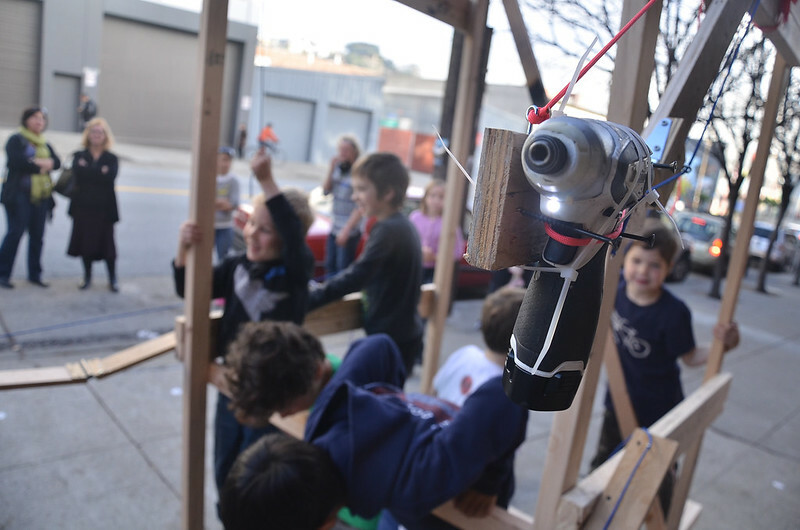 With the arms attached, the head went on and we enjoyed that first beautiful moment when disparate ideas come together to make something bigger and better than any one person or team could have done alone. With a decidedly complicated software uploaded (totaling 5-10 child pilots at any given time) we set the robot on some tasks. Hammer this. Deliver a flower to that guy. Use the wrench to grab that pole. The team work needed and executed on was something spectacular to behold.